Friday, 6 July 2018 from 5:00 PM to 9:00 PM + Add to calendar06/07/2018 17:0006/07/2018 21:00Australia/SydneyHELLO TUT TUT + DEVIL ON THE ROOFTOP at The Metropole for 'Metro Social' Katoomba, Blue Mountains - FRI 6th July 2018HELLO TUT TUT + DEVIL ON THE ROOFTOP at The Metropole for 'Metro Social' Katoomba, Blue Mountains - FRI 6th July 2018 Friday, 6 July 2018 from 5:00 PM to 9:00 PM (AUS Eastern Standard Time) Organiser Charity Mirow 0409042869 info@fusionboutique.com.au Address The Metropole Guesthouse, upstairs "Metro Social" Cnr of Lurline and Gang Gang Streets Katoomba NSW 2780 Australia Event web page: https://www.stickytickets.com.au/65694/hello_tut_tut__devil_on_the_rooftop_at_the_metropole_for_metro_social_katoomba_blue_mountains__fri_6th_july_2018.aspxThe Metropole Guesthouse, upstairs "Metro Social"
Hello Tut Tut are dynamic and daring when it comes to creating original music. 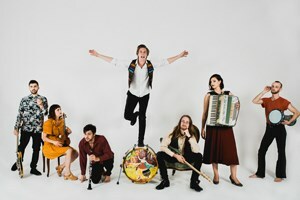 Tapping into their European roots, the band has a fresh take on the Klezmer, Balkan, Gypsy and Latin musical traditions. By blending these styles with the pulse of contemporary dance music, this seven-piece brings a high energy show that gets you up and dancing. They have made a speedy ascent on the World Music scene, winning over local and international crowds with their performances at Falls Festival (Byron Bay), Bello Winter Music Festival, Live en Août (New Caledonia), Rainbow Serpent Festival and a collection of Australia's most recognised venues and night markets. The group have recently completed their third Australian tour, returning to Melbourne to finalise their debut album which is set for release in March 2018. DOTR is combination of the talents of Jess Randall (The Crooked Fiddle Band) and Morgan Haselden (Mimosa). Morgan Haselden founded 'Mimosa', a modern Gypsy duo, which has toured Australia and France. 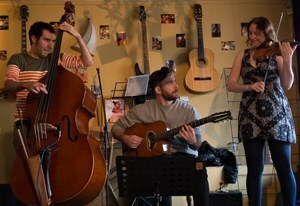 Morgan has studied under some of Australia's best classical guitarists and performs regularly as a Classical and Gypsy performer. Venue: Metropole Guesthouse Lounge, Upstairs (lift available) Cnr of Lurline and Gang Gang Streets, Katoomba, Blue Mountains NSW 2780.